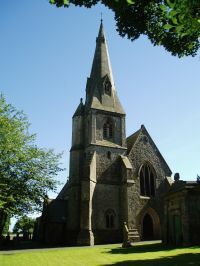 The church serves the Catholic communities of Thurnham, Ashton, Condor Green, Forton, Glasson Dock and Cockerham with an approximate head count of 60. In the year ending December 2014, the parish celebrated 3 marriages. The average Mass attendance is in the region of 48. The parish is rural in nature, the highest population concentrations being in Glasson Dock, Cockerham and Forton. Year round, there are a number of visitors from Thurnham Hall (holiday apartments) and in the summer, there are also regular visitors from the local holiday caravan sites. Since November 2001, significant fraction of the congregation, has been made up of parishioners from St. Bernadette's Church. After Easter 2009, the Diocese closed the church of St Joseph's, Galgate and re-merged it with Ss Thomas & Elizabeth's. Although this was a bereavment to the parishioners of St Joseph's, it has become a great blessing to Thurnham as the St Joseph's parishioners have brought their talents to our parish. We extend a warm welcome to visitors and new parishioners: please make yourself known to Father Peter. If you are interested in learning more about the Catholic faith, please ask Father Peter about the R.I.C.A programme (Rite of Christian Initiation of Adults) or visit the Diocesan web page about the Catholic Faith. Come Home for Christmas is an initiative of the Catholic Church which aims to offer a seasonal welcome to Catholics who for different reasons no longer or rarely attend Mass. Whatever your story or journey, the door is open for you. The journey back into the Catholic Community can of course happen at any time and the information on the web-site may therefore be of help to you at any point throughout the year. You are most welcome to come forward at the Eucharist and receive a Blessing from the Priest, if for any reason you feel unable to receive Holy Communion. Mass is celebrated at 9:00am on Sundays. The Saturday Vigil Mass is celebrated at 6:30pm at St. Bernadette's Church, Bowerham where a later Sunday mass (11:00am) is also celebrated. Details of other local churches, schools and societies can be found at the Diocesan web-site, where a comprehensive list of links to other web-sites of interest can be found. The church is located almost 5 miles south of Lancaster off the A588. Access to the church is gained using the signed private road to Thurnham Hall to the east of the A588. Travelling from Lancaster on the A588, this private road is set in on the left hand side and is flanked by a short stone wall, almost immediately opposite a well-disguised wooden bus shelter, one mile south of the Stork Public House at Condor Green. For the moment the church is served by the number 89 bus on Mondays - Saturdays ( Lancaster-Knott End via Glasson Dock) although this does entail a half-mile walk from Thurnham Hall gate, but this service may be discontinued soon. Please check a current timetable. There are many different ministries within the church: if you would like to know more about ways in which you could contribute, please see Father Peter or ask for a ministry leaflet. The leaflet groups ministries into broad areas such as: visiting, liturgy, catechetic, spirituality, working with young people, administration, communication and social and fund-raising. Please ask for more details. Penitential Service in preparation for Easter: Tuesday 16th April at 7pm at St Bernadette's. Mass of the Lord's Supper: 7.00 pm at St Bernadette's. 9.00 am Mass at Thurnham. 11.00 am Mass at St Bernadette's. Our parish Retreat Day will be held at Hyning Hall on Saturday 13th April. The Annual Ecumenical Open Air Songs of Praise will be on Sunday 26th May 2.30pm in the Dalton Arms Car Park. All most welcome! Come along and sing your favourite hymns accompanied by Blackpool Brass. Our monthly collection for the homeless shelter is on-going. There is a basket for donations at the back of the church. Last year, 2018, our annual parish donation went to Children of Hope (£250), the Lancaster Neuro Drop in Centre (£500), Mary's Meals (£250) and SPICMA (£250) . Tickets are still available for our annual Easter Egg Raffle in aid of CAFOD. Next Parish Property Meeting, Thursday 26th April in church. Next Parish Pastoral Council Meeting, Thursday 23rd May in church. Our neighbours from the Anglican churches are running the Monday Munch, meeting up for company and a light lunch on the second Monday in the month. Look out for the posters for more details. Thank you to everyone who came along to our parish social on 1st March and joined in the celebration of the 170th anniversary of the consecration of the church, and to those who contributed in any way. Thank you for making it such an enjoyable evening! The outstanding parish debt to the diocese has been repaid in full . The total amount spent on the building repairs to date is £85,565.09. We are very grateful to English Heritage for a grant of £47,355.73 towards this work and to all who have donated their time, talents, energy and money to the fund. Many thanks to all concerned.